Lightweight, easily portable, light duty unit for domestic use. Includes 4m hose, trigger gun and T50 patio cleaner, high pressure and dirtblaster lances, foam nozzle, concentrated patio and deck cleaner, concentrated car shampoo and washbrush. 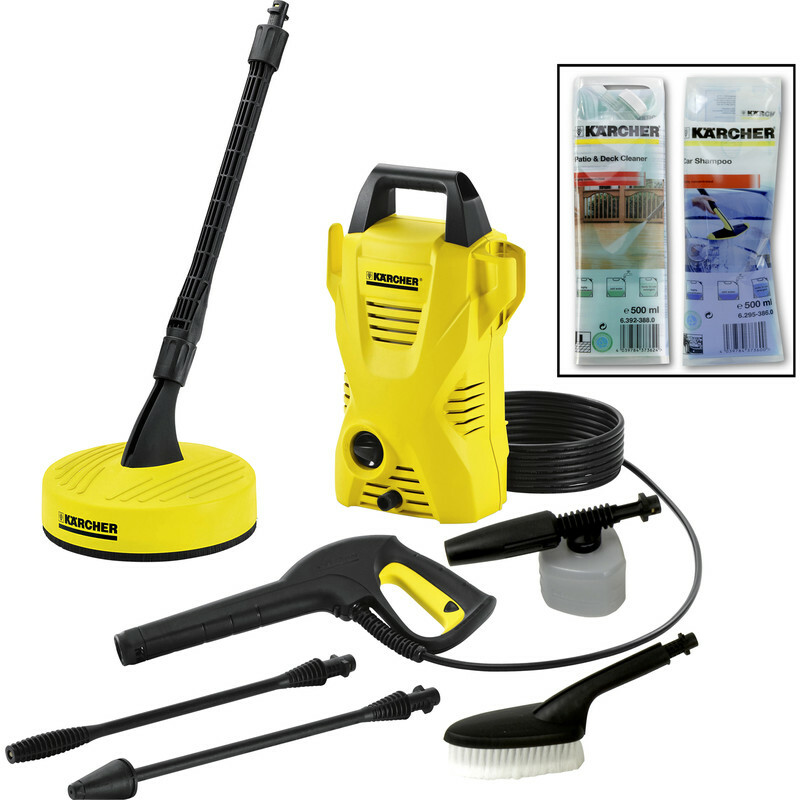 Karcher K2 Compact Car & Home Pressure Washer 240V 110 bar is rated 4.4 out of 5 by 7. Rated 5 out of 5 by Bocca from Impressive power Bought this to replace a larger, heavier slightly more powerful old pressure washer. Mostly for car washing but also occasional patio cleaning. Feels more powerful and I am impressed with how light and effective it is. I barely need to wash the wheels after a blast with this. Highly recommended. Rated 2 out of 5 by Andy1908 from Returned this washer I thought a Karcher was the best, so I bought one. Only to find that, like everything else on the market it is now made to inferior standards and relies on its once outstanding reputation. Within ten minutes of use, the so called high pressure hose bubbled and started to leak. I returned this washer to my nearest store and the young lady, despite having no internet access, dealt with my complaint in a professional and satisfactorily manner. This is why I have rated it so high, not for Karcher but for the young lady's professionalism. Rated 5 out of 5 by mississipi from My Review for Karcher K2 Compact Car & Home Press Although i paid for delivery for 12 noon the next day, didnt receive product till the monday This is not a negative review as there was traffic delays and road works so that didn't bother me at all. Things like that happen. As a father of 3 I was just so pleased to recieve the product as i had saved up money to buy it. You will not be dissapointed with this a great little pressure washer. Rated 5 out of 5 by Baptist from Excellent pressure washer I bought this recently, and am pleased with the extra tools you get with it. It does an excellent job, really pleased with it. Rated 4 out of 5 by wizz from Works well We bought this for various jobs some of which we have still to do but it seems to work well.